Nepal is a standout amongst the most beautiful nations in South Asia gifted with 8 of the world's most highest mountains above 8000 meters including crown of the world ‘Mt. Everest’ and more than 1310 glorious peaks above 6000 meters. It is one of the wealthiest nations on the planet in terms of bio-diversity: thick tropical forest, variable territory, high altitude vegetation overflowing with an abundance of different flora and fauna, rivers, hidden valleys and forested slopes. Nepal has been remarkably appealing destination for travelers, philosopher, and researchers too. Tour in Nepal with Namaste Treks gives you a chance to visit around the well-known touristic destination, get bits of knowledge on local culture, tradition, festivals and also explore around the high Himalayas to lowlands of Terai. We have arranged the packages for tour in Nepal in a manner that the traveler can get the full advantage from it. Based on the past working experience, whether short or long duration, these tours have been specifically custom-made to match the interests of our customer. Tours in Nepal provides different taste and feel of amazing experience while visiting culturally and naturally beautiful touristic destination like Kathmandu, Pokhara, Chitwan and Lumbini etc. Kathmandu is the capital city which provides the blend of ancient history, scenic grandeur and vibrant cultures including 7 UNESCO world heritage sites. Pokhara is famous as the lake city and is another popular destination for tourists. 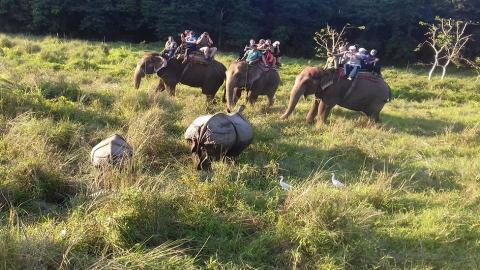 Chitwan has a lot to offer for a weekend gateway, mainly including wildlife and natural habitat. Lumbini is the most serene place in Nepal, which is the birth place of Lord Buddha. All these destinations are amazingly beautiful and wonderful for tours and travel experience in Nepal. Family Tour is considered as the effective tours who want to spend memorable time with their family members and beloved ones.